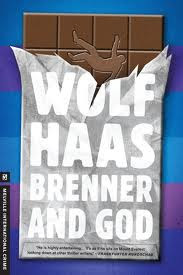 A few years ago I saw a film based on one of Wolf Haas's series based on a former cop named Brenner and have been hoping since then to be able to read some of the original novels. Now, finally, Brenner and God has arrived in English courtesy of Melville House/Melville International Crime, in a translation by Annie Janusch. The film I saw was Silentium, a darkly comic story based on Haas's fourth Brenner book (Brenner and God is made from the seventh and apparently most recent in the series). Silentium was the Austrian entry in the European Union touring film festival for that year, and there are two other Brenner films, one earlier and one more recent than Silentium. Though it's the seventh novel in the series, Brenner and God reads almost as if it were the first. Brenner, who left the police force some time before, has found what he now thinks is his perfect job: being a driver for a wealthy developer (who lives in Munich) and his wife (a doctor who runs an abortion clinic in Vienna) and especially their daughter Helena (whom he shuttles back and forth between the parents). While driving Helena along the autobahn between her parents, Brenner stops for gas and Helena is kidnapped. Brenner is fired but becomes involved in the search for the kidnappers, a search that ultimately leads to a number of deaths. The story is lively and the characters are vivid, but the most interesting aspect of the novel is the voice of the narrator. 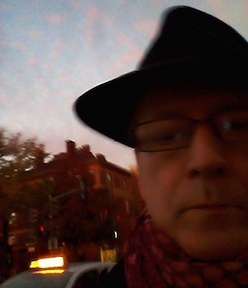 The story is told in the first person, but not by one of the characters. The narrator, though very present in the story, is an omniscent eye, who knows where the story is going and constantly addresses the reader with suggestions of upcoming deaths and the timeline according to which things are going to happen. The narrator is also constantly indulging in digressions, in a loopy but entertaining monologue. The result is that the reader gets a double benefit: a story that is engaging and has a rapid momentum and a narrative voice that is darkly comic. There's a disgusting plot element that reminded me of the grossest part of Jo Nesbø's Headhunters (anyone who has read that book knows what I'm talking about) but in a more grotesque but oddly funny way. Brenner comes in for a good deal of punishment before the book is over, in a long tradition of noir detectives who are forever getting thrust into painful and threatening situations. But Brenner rolls with the punches. His marginal professional status is an interesting aspect of the series, allowing Haas to put Brenner into situations beyond the typical police and private detective tropes. Melville House graciously sent me a galley of Brenner and God (full disclosure) but speaking honestly when I say that my long wait for the Brenner books was delightfully fulfilled with this book. I can only hope that Melville will go back and give us the earlier books (and I'm trying to find the other movies as well, now, all of which feature Josef Hader as Brenner, with Wolfgang Murnberger as director. This is great thought writing about the Austrian crime. Austrian crime is all most normal in the world crime level.